If I had to pick one part of my appraisal business that has increased over the last several years it would have to be pre-listing appraisals. A pre-listing appraisal is one performed before putting your home on the market for sale in order to get an accurate asking price. This may seem pretty straight forward, and you may ask “isn’t that what my real estate agent is for”?, but there are some situations where a pre-listing appraisal makes sense and that’s what we’ll be discussing today. There are times when a pre-listing appraisal is not necessary. This situation might occur when you have an agent that has lots of experience selling homes in your area. You will know what the square footage of your home is in order to compare apples to apples since you’ll want to bracket the size to get the most accurate estimate of value. There will be plenty of recent sales and homes that are currently listed for sale. When coming up with a list price it’s a good idea to compare your home to what has recently sold as well as what is available for sale because potential buyers will be making these same comparisons. After all, why would someone buy your home if they could buy something similar for a lower price? If the above describes your situation then I’d advise passing on a pre-listing appraisal. Since things are rarely perfect I’d like to describe some situation where it might be wise to seek the expertise of an appraiser. Having a home that falls outside of the norm for the neighborhood can present problems when pricing it for sale. The situation I see occur quite often involves pricing your home based on the price per square foot for the area, however there is a problem with this. When looking at houses that are similar with the exception of size, homes that are smaller tend to sell for more per square foot, and those that are larger sell for less. If you take a price per square foot of the recent sales in the neighborhood and multiply it by your home’s square footage you will typically over price a larger home and under price a smaller home. This is why price per square foot is not the best way to price your home, especially when dealing with homes that are outside of the norm for the area. An experienced appraiser will choose comparables that bracket the square footage of the house so that you get a more accurate indication of value. 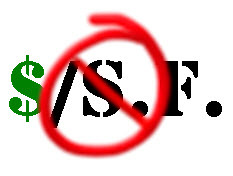 As I mentioned above, in a perfect world there will be nearby recent sales that can be used to help price your home, however what do we do when there are none? A questions I get asked often by agents is “how far away can we go for comps“?. When recent sales are not available within the immediate neighborhood it’s important to know where you can look for comparables. Hiring an appraiser for a pre-listing appraisal in a situation like this can benefit you because they will know what areas to look in to get sales that are similar to your home. Distance is not always the most important criteria that you should go by. If you used sales in the immediate subdivision that are older they may not reflect what is going on in the real estate market at the current time. If the market has been getting better since these sales occurred then you’ll probably under price your home. Likewise, if the market has taken a downward turn then you’ll overprice your home which will result in it staying on the market for too long. One mistake that many homeowners make is confusing cost with value. It’s understandable that you would want to recoup a $50,000 investment you recently made in your home but you have to consider what the majority of buyers will pay for these improvements. If buyers will only give you $25,000 for the kitchen renovations you paid $50,000 for then pricing your home to help cover your costs will not be a smart move. A better move to make would be to find out what your home might be worth after the improvements are made and then compare that to the actual costs. This is known as a “subject to” appraisal which is not what we’re discussing here but I thought I would mention it so those homeowners considering improvements would know about it. If you’ve already made extensive improvements then you’ll need to know exactly how the market views them, or put it simpler terms, how much of a return on your investment you’ll get. A current pre-listing appraisal will compare your home with all the recent improvements to other homes that are either in similar condition or that have also had renovations. What you don’t want to do is come up with your list price based only on the cost involved since this will usually overvalue your home. If your home has been on the market for a long time, and you’re having a hard time selling it, then it could be overpriced. Pricing is at the top of the list when it comes to reasons that a house will not sell. If a home is priced correctly then the chances of it selling are increased. There are many factors that go into a home being properly priced, some of which I have mentioned here. A pre-listing appraisal will take into consideration your home’s location, appeal, and condition so that it will be priced to the market and be the most competitive. I’m not a real estate agent but I’ve been around enough that have said that any house will sell if it is priced right. Pricing a home based on comparable sales and listings rather than what you have invested in the home is what should be the main objective of the seller. As I mentioned above it is so easy to let outside factors get involved when selling your home, and if you’ve had your home listed for sale for a while with no luck you may want to ask yourself if this is what you have let happen. 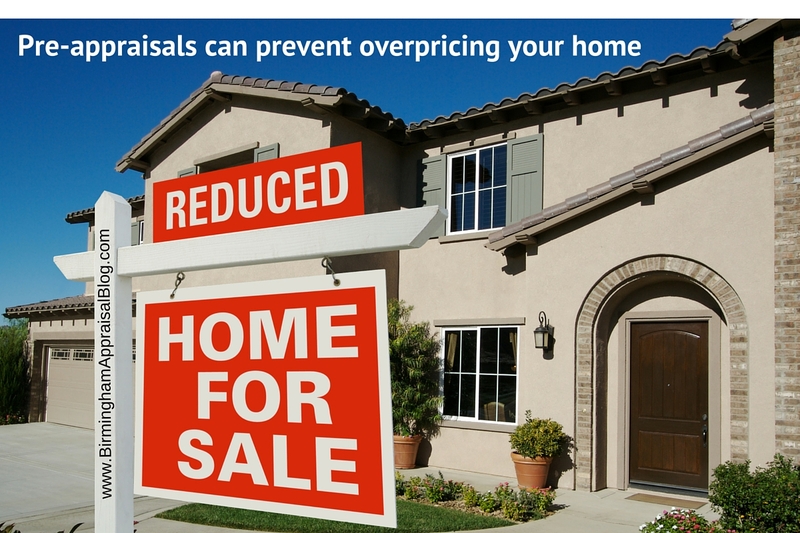 Many people don’t consider using a pre-listing appraisal in this way but they should. During the buying process buyers and sellers go back and forth with offers and counter offers because each is concerned with getting the price that works in their favor. A seller can offer a copy of the report to the potential buyer to ease their mind that the home is worth what they are listing it for, and that the bank financing should not be an issue because it will appraise. Real estate deals fall through all the time because homes don’t appraise for the contract price. This can be avoided with a pre-listing appraisal. Another use is for a rebuttal. If there is a problem with the mortgage appraisal then the pre-listing appraisal can be used to compare with the bank’s appraisal. Sometimes appraisers do make mistakes and if the bank appraisal has incorrect square footage, which has caused the value to be lower than the contract, then this can be checked against the previous appraisal. Something else that may be useful if the mortgage appraisal comes up low would be to check the comps that were used. If both appraisals did not use the same comps then the sales that were not used can be provided in a reconsideration of value. It goes without saying that you should strive to hire the most competent appraiser you can find to do your pre-listing appraisal or everything I’ve written about here doesn’t matter. You want to make sure that they have the education and experience to provide you with the most accurate opinion of value. You should decide, based on your own set of circumstances, whether a pre-listing appraisal is right for you. Do you have any other questions about how a pre-listing appraisal can benefit you? If so contact me and we’ll talk.